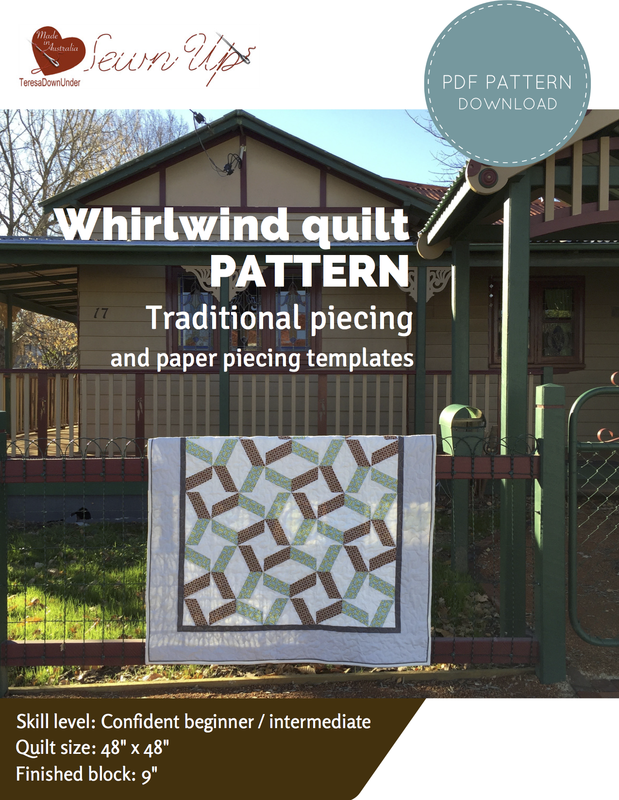 Whirlwind is a quick and easy quilt suitable for confident beginners. The pattern comes with traditional templates. If you prefer to make the quilt with foundation piecing, you will also find foundation piecing templates in the pattern. Quilt size: 48” x 48”. Quilt technique: traditional piecing OR foundation piecing. For best results, use two different colour fabrics of similar value, for instance two light fabrics or two medium fabrics. The quilt has two visual interpretations depending on whether you focus on the windmill pattern or on the negative space of the quilt, which is a bracket shape. In the 15 page pattern I have included lots of diagrams and written instructions, traditional templates, foundation piecing templates, colour scheme suggestions as well links to 3 of my video tutorials. If you share photos of this quilt please tag me @teresadownunder and use #whirlwindquilt when sharing on Instagram.